Wiggle Room is one of Ashley's Microgames in WarioWare: Smooth Moves. This microgame returns in WarioWare Gold as one of Dr. Crygor's microgames. 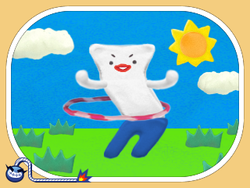 The player has to move the Wii Remote in a circular motion to spin the hula hoop, or wiggle their hip, as it is supposed to be while using "The Big Cheese" form. In WarioWare Gold, this game is played by tilting the Nintendo 3DS. 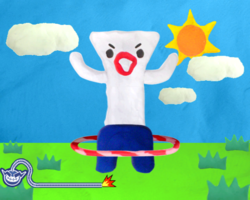 1st level difficulty: A standard hoop. The person is a white creature with blue pants. 2nd level difficulty: A doughnut. The person is a fork-shaped creature with purple pants. 3rd level difficulty: A tire. The person is a red pepper-shaped creature with green pants. There is a chance the red pepper-shaped creature has realistic eyes and mouth. This page was last edited on October 16, 2018, at 19:37.